Compared to Travel Trailers, 5th wheel RVs tend to be heavier, cost a little more and require a special hitch mounted in the bed of your truck for towing. However, you will not be disappointed in your Fifth Wheel purchase. Fifth Wheels are luxurious, come fully loaded with amenities, appliances, and furniture and feature more living space and storage. Simply put, you get what you pay for, and then some. Fifth Wheels will feel like the perfect home away from home and you won’t feel cramped when camped out for an extended period of time. Each model and floorplan offer something different, so take your time shopping around and find the perfect RV for your needs! 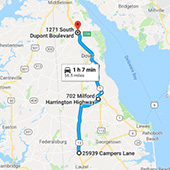 At Delmarva, we have a huge inventory of New & Used Fifth Wheels for sale in Smyrna, Delaware, Seaford, Delaware and Milford, Delaware from the best brands including Coachmen Fifth Wheels, Dutchmen Fifth Wheels, Fleetwood Fifth Wheels, Forest River Fifth Wheels, Grand Design Fifth Wheels, Keystone Fifth Wheels, Jayco Fifth Wheels and many more! Check out our entire inventory below and contact us if you have any questions, concerns or wish to check out a unit!